I got for my collection an untested boardset of Defender which was really in great conditions with no battery acid leak. The boardset is the newer revision of Defender with the red label roms. 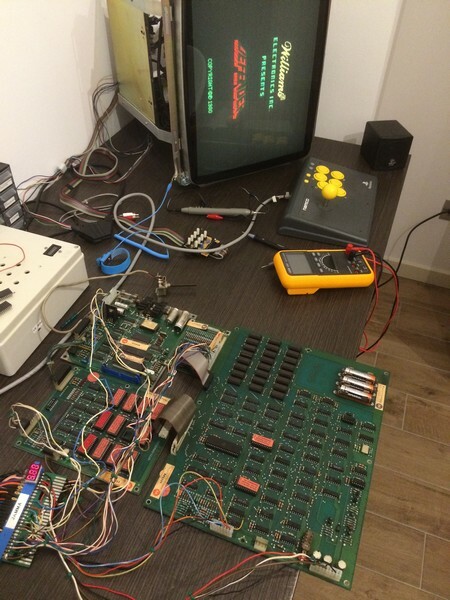 The game is very difficult to find it in working conditions nowadays because it has several weak points, expecially the 24 drams 4116 which are very unreliable to due the fact the run very hot and they require +5V, -5V and +12V to be applied at the same time, otherwise they will be damaged. The old Williams PSU become defective and often they ruin the drams. After converting it to Jamma and triple checked all the power supply lines I booted it up but the game appeared to be dead. Fortunately Defender has a lot of bibliography and a very good manual which is also a troubleshooting guide. I check the clock and it was working correctly, but after checking the reset line I saw it was pulled low all the time. To make it short, Defender has two +12V power supplies, one regulated and one not. You have to supply +12V also to the not regulated one because it is needed for the power on reset. After adding that +12V t, the game booted but as soon as the message ALL UNIT OK was displayed it reset in a never ending loop. I found out that the problem was caused by the ribbon cable , after reseating it a couple of times, the game booted correctly. I started the game but the ship kept always going down. With the test menu , it reported that the down direction was always pushed. I checked the interface board which has the circuit for the inputs. the hex inverters 4049 were all toggling correctly, the pull up resistors were good therefore there was only one chip to check: the Peripheral Interface adapter 6821P. I desoldered it and installed another one I had on stock taken from another arcade games. Since I had no way to test it, I decided to put a 40 pin socket just to be sure I could easily swap it with another one in case it was defective. Luckily the inputs were now correct, thefore I could declare the board fixed. In the end I was very lucky because the game had only the input problem and no other issues. Concerning the compulsory triple voltage supply (+5V, +12V and -5V) , a lot of old board from the 70s and early 80s are concerned. 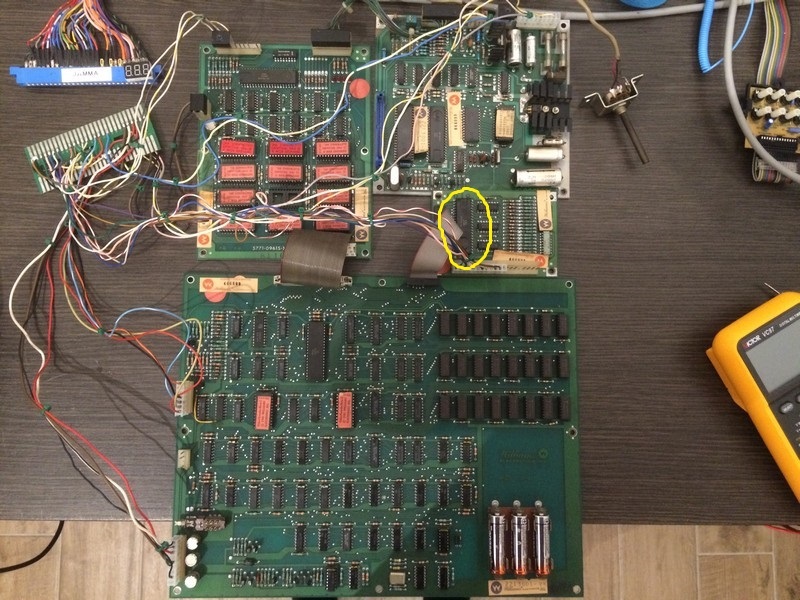 Most collectors think the -5V is used just for sound on those old games (as some 80s and early 90s boards do) but it’s not at all. As you said, RAMs, buffers, and CPU die pretty quickly if one is missing. 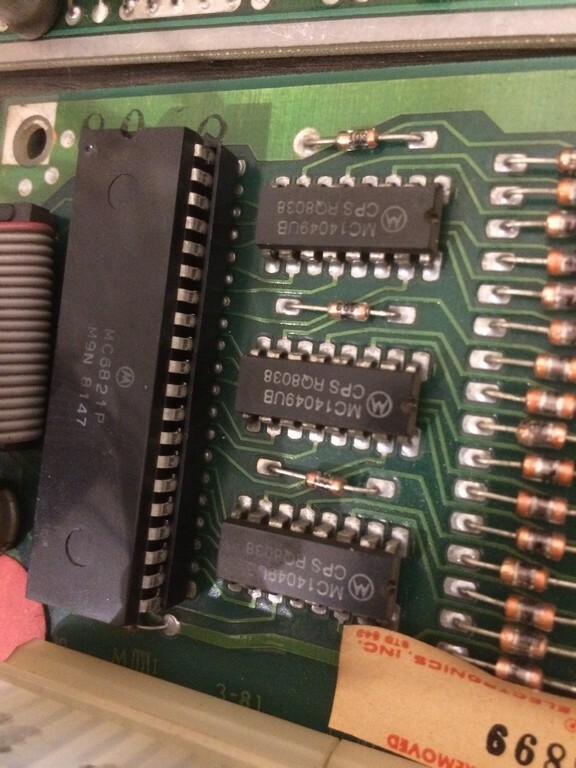 Some of the Space Invaders boards I’ve had for repair had the 16 RAMs dead because of the lack of -5V. That’s a hell of a job for such a stupid mistake (16 * 22 = 352 pins to desolder/resolder).